What we know today as Dunham Public Library began life as the family home of Reverend Moses Dunham, the father of George Earl Dunham, the namesake of our library. The Moses Dunham residence is first listed in the Atlas of Oneida County, NY, published in 1874. The Dunham home is believed to have been constructed between 1864-1874. Dunham Public Library has two copies of this 1874 atlas in its collection. During the history of the building, two additions were built on the original Dunham home. One was added to the back of the house shortly before 1907. The second addition was the front entrance to the library added after Mrs. Dunham’s death in 1945. An attempt was made to match the architectural style of the original house and this was built for the purpose of having a new entrance for the library. The roof of the 1945 addition has a copper roof instead of slate. It was paid for with part of her $30,000 donation to the library. The Dunham house also had a circular driveway in 1907. The Dunham House still has all of its original trim around the ceilings and windows. The trim is 1” thick and about 8” wide. The original hardwood floor is now carpeted but intact. The house still has its original staircase and inside doors. There are two book cases dating back to the original house. There is a fireplace of polished marble. The decorative mirror at the top of the stairs has been there since the library came into being. Upon the death of George Earl Dunham on October 29, 1922, his will stipulated that the home of his late father, Reverend Dr. Moses Earl Dunham and the sum of $7500, would be donated to the Union Free School District of Whitesboro for the establishment of a library. The money and property was to be used for the purpose of a public library or transferred into a trust for Hamilton College. With the help of his wife, Helen, it was decided to open a library. The plan became a reality on July 25, 1927. On October 28, 1926, Dunham Public Library was chartered and incorporated as a free public library serving the Union Free School District of Whitesboro. Lucia A. Kelly of Dolgeville was the first librarian and Helen Dunham, George’s widow, checked out the first book. 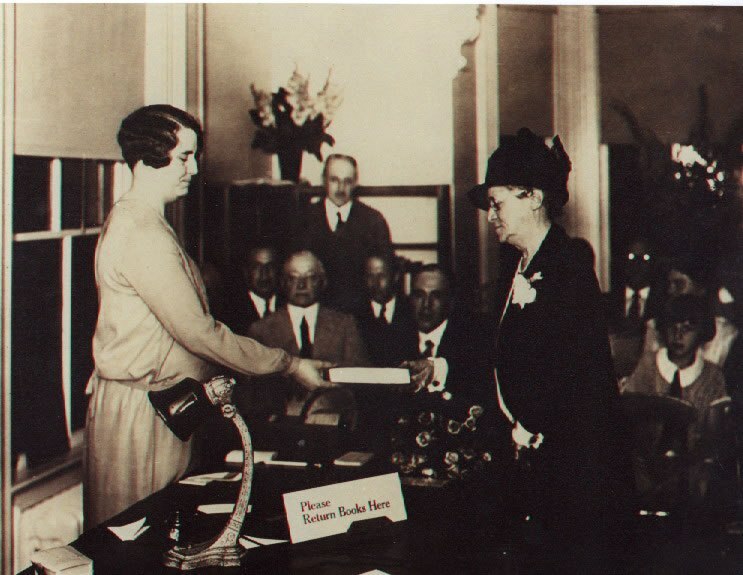 Helen Dunham worked hard and donated time to prepare the library for its opening on July 25, 1927. Mrs. Dunham died in 1945 and left furniture, her personal library and $30,000 to the library. On October 28, 2016, Dunham Public Library celebrated the 90th anniversary of achieving its charter and looks forward to serving its community for many years to come.